which are worth the wait! There’s nothing worse than having your heart set on somewhere extra special for your upcoming holiday than having your plans dashed. Think about it. You’ve reached Orlando, you can see Donald Duck waving frantically in the distance and that pinnacle of your dreams that is Space Mountain, only to be informed that there’s a minimum two hour wait. Two agonising hours before you can clamber on board your favourite fairground ride of all-time! ‘book early to avoid disappointment’. If you think that’s tough, wait until you’ve seen how difficult it is to get to this lot. 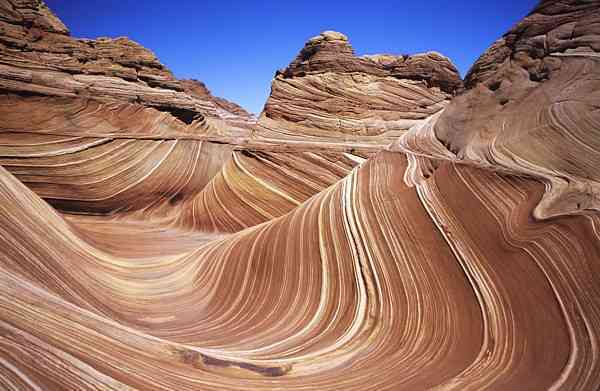 Actually found on the border of Arizona and Utah, the Wave is a fragile rock formation with a psychedelic appearance formed from 200 million year old Jurassic dunes compressed through time to produce the phenomenon we now see. Until recently, the Wave was deemed only one of dozens of geological attractions in an area close to the Grand Canyon, Monument Valley and Utah’s stunning Bryce and Zion national parks. Now it’s all the rage but here’s the catch: the US Bureau of Land Management (they sound a bundle of fun) allows only 20 visitors per day to the area. Ten passes are issued through an online lottery, the other ten are handed out in another lottery to people turning up on the day. If it takes your fancy, arrive early or you’ll find yourself looking at the backs of over 100 other hopefuls. The Turin Shroud is claimed to be the burial shroud of Jesus. Bearing the faint image of a man who appears to have been crucified, the validity of the shroud has understandably been at the centre of controversy over the years. Nevertheless, people clamour to see this precious cloth which is normally kept in a sealed aluminium case containing argon gas to preserve it. Owned by the Vatican, the Shroud is unveiled for exhibition around five times in every century. During its last outing in 2010 half a million people queued to see it over a two month period. The next showing is scheduled for 2025 so if you’re interested you’d better contact His Holiness the Pope and well, form an orderly queue. Space, it looks like Captain James T Kirk was right, it truly is the final frontier. Obviously bored and looking for something new to do, Richard Branson unveiled plans for Spaceship Two (the successor to an earlier Spaceship One). For the ultimate in activity holidays, Virgin Galactic offers you the chance to join a space tour and head beyond the stars - as long as you have plenty of dosh that is. Around $200,000 to be precise. Oh, and lots of patience. The waiting list currently stands at 80,000 and counting. Plus you need to be fairly fit for the rigours of real space travel but I wouldn’t worry too much. Safety statistics for manned space travel don’t match the commercial air travel requirements so they won’t be letting any of us up there for quite a while. Time to get fit and save up the cash then! Immortalised in the Clint Eastwood movie, Escape from Alcatraz (and revisited in the Sean Connery/Nick Cage escapade, The Rock) this once grim prison is now a popular tourist attraction. Ranked as one of the most haunted sites in America, reports abound of ghostly whistling, apparitions and prison doors slamming shut. With its history of suicides and inmates murdering other inmates, the infamous ‘Rock’ sounds more like a place to avoid than a starting place for your adventure holidays. Not so because as well as a hot spot for tourist days out, groups of up to 35 people can now enjoy an overnight stay in the infamous Cell Block D, reserved for solitary confinement and allegedly the most haunted part of Alcatraz. Believe it or not, there is a waiting list for this privilege. Would-be ‘guests’ must be members of a non-profit organisation, take part in a lottery and pay $2,000 for the privilege. On top of that, on arrival two hours are allocated to cleaning duties! You pay for this? Why? This smattering of in-demand tourist attractions is only the tip of the iceberg. From the White House to Welbeck Abbey (yes, Welbeck Abbey in Nottinghamshire) waiting lists are getting longer and longer. So, you know what they say: ‘book early to avoid disappointment’. Biog: Kate Smedley queues up patiently to bring new and interesting activity holidays to you.